Total Weight Gain/Loss: (Believe it or not) Still only up about 8 pounds…I feel like I look like I’ve gained a lot more though! 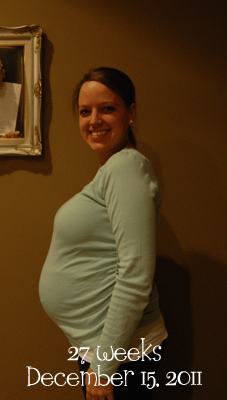 Maternity Clothes: All the time…I’m very thankful my principal ok’d us wearing jeans until we’re out for Christmas – I’m LOVING the maternity jeans right now! Belly Button In/Out: Still working its way out. It’s almost flat sometimes now! Stretch Marks: None, thank goodness! But I’ve been very itchy…doesn’t that mean your skin it stretching? Movement: Mostly in the afternoon/evening/night, like last week. And I for sure felt hiccups this week! They kind of feel like mini thumps every few seconds, like when I first started feeling her, but I know they’re hiccups because they come in regular intervals (every second or two). Pretty cool! Sleep: Ok…just can’t get enough of it! What I miss: Not much of anything! What I am looking forward to: Being DONE with Christmas prep…it’s fun to be pregnant during Christmas, but it’s also exhausting! Cravings/Aversions: I’ve wanted a lot of sweets…hoping my glucose test doesn’t change that next week! Symptoms: Still lots of Braxton Hicks, especially if I don’t just chug water all day. Kind of achy if I’m on my feet too much, lots of trips to the bathroom, itchy stomach. Best Moment This Week: The hiccups were fun!